1. Sign up and reserve your U-Box online - Create an account, choose your drop-off date, location, number of U-Box containers you need to reserve, and the insurance desired. 3. Load and lock your U-Box - Load up your container and lock it up using the free lock included. 4. We pickup and store your U-Box - After the 48 hour time frame, we pickup your U-Box and store it in our climate-controlled facility. 5. We deliver - On scheduled dates in September, your U-Box container is delivered to one of the 4 on campus locations. You will then have 48 hours to unload the U-Box. Deliveries made off-campus or on any other non-scheduled date are at an additional fee ($198 and up, call for rate). Initial Drop-off Dates: We drop-off on the dates below to one of the 4 on-campus locations. U-Box containers can only remain on campus 48 hours after your drop-off date. 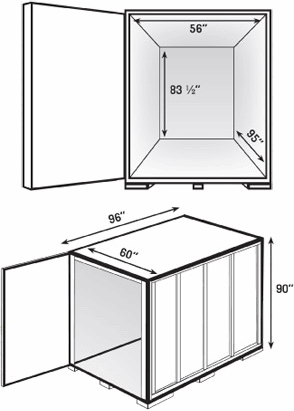 Height: 83 ½" or 6'11 ½"
Diagonal: 110 ½" or 8'4 ½"
We recommend watching our quick, informative video on how to properly work with and load your U-Box container before starting. Then, be sure to follow the helpful tips below. All avoid any empty space and stack items to the ceiling of the U-Box container. This will avoid load shift. Secure all rows of furniture and boxes with tie downs and rope. Fill empty spaces with sofa cushions, bagged pillows or U-Haul furniture pads. Place the heaviest items on the floor and distribute weight as evenly as possible. Avoid putting the heaviest items to one side, and put extremely heavy items in the middle of the box. Wrap all un-boxed items in furniture pads securely for padding protection. Load no more than 2,000 lbs into each U-Box container. Stand sofas and mattresses on end and disassemble bed frames to maximize space. Wrap your items in U-Haul furniture pads. Take advantage of tops of dressers to stack boxes and other items. Keep furniture pads in between the dresser top and the items. Pack your belongings in each box tightly to avoid shifting of contents during transport. Use U-Haul bubble wrap and packing paper in between each item. U-Haul packing boxes are built for stacking to help maximize your storage space. Disassemble furniture to allow for tighter packing, and for easier moving. Wrap all items in U-Haul furniture pads. Pack books in U-Haul book boxes for easier lifting. Label each box to indicate it is fragile. Pack the contents with U-Haul bubble wrap and packing paper. Pack mirrors and pictures in U-Haul mirror boxes and bubble wrap. Wrap these boxes in U-Haul furniture pads. Reinforce the bottom of boxes with U-Haul packing tape. Coat fine wood furnishings with wax to prevent against scratches. Wrap these items in U-Haul furniture pads. Copyright © 2006 - 2017 Collegeboxes. All rights reserved.